Kemi Online ♥: Vivica Fox reveals new silver grey highlights! 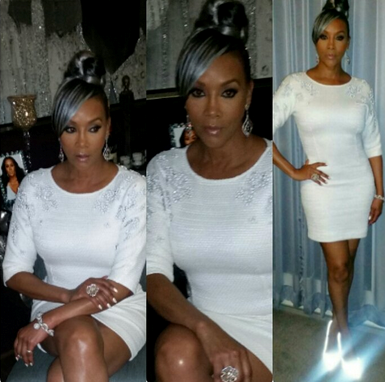 Vivica Fox reveals new silver grey highlights! Work mama. I hope I look this good at 51. That's all I'm saying. I mean dam V. For the new year, Vivica Fox showcased her new slick gre silver tresses at the The Hateful Eight Celebration amongst Quentin Tarantino and other reputable filmmakers, at the Sunset Tower Hotel in Hollywood yesterday night. She looks fab. 50 Cent you lookin son? Lol.